In this July 7, 2017, file photo, U.S. President Donald Trump meets with Russian President Vladimir Putin at the G20 Summit in Hamburg. 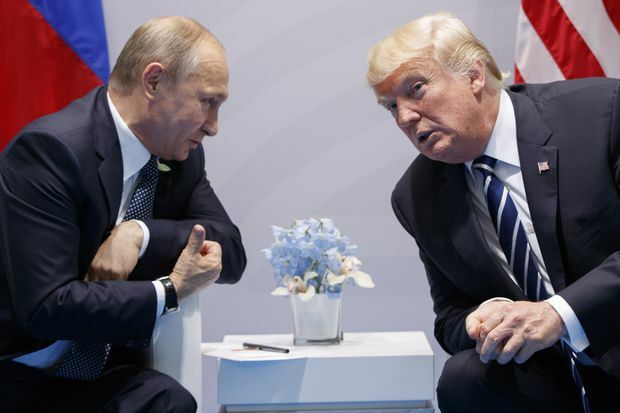 U.S. President Donald Trump and Russian President Vladimir Putin will meet for their first summit on July 16 in Helsinki, a venue famed for its Cold War diplomacy. The Kremlin and the White House simultaneously announced the place and date a day after reaching an agreement for the two leaders to meet following a visit to Moscow by U.S. national-security adviser John Bolton. Mr. Trump will meet Mr. Putin after attending a July 11-12 summit of NATO leaders and a visit to Britain. The date will give Mr. Putin a chance to attend the July 15 closing ceremony of the soccer World Cup hosted by Russia. The two leaders have met twice before on the sidelines of international gatherings and spoken at least eight times by phone. They have also made positive comments about each other now and then, with Mr. Putin lauding Mr. Trump’s handling of the U.S. economy. The summit could irritate U.S. allies, such as Britain, who want to isolate Mr. Putin, or countries such as Ukraine who are nervous about what they see as Mr. Trump’s overly friendly attitude toward the Russian leader. It is also likely to go down badly among critics who question Mr. Trump’s commitment to the NATO alliance and who have been concerned about his frictions with long-time allies such as Canada and Germany over trade policy. Relations between Washington and Moscow became the most strained since the end of the Cold War during the administration of president Barack Obama, who imposed sanctions for Russia’s annexation of Crimea from Ukraine. U.S. intelligence agencies accused Russia of interfering in the 2016 U.S. election, an allegation Moscow has repeatedly denied. “We need each other, not because we want to love each other. We don’t want and we don’t need to be loved. We simply need to hold normal, pragmatic relations with a major country upon which – like what lies upon us – a lot in the world depends,” Mr. Nebenzia told a news conference at the UN. Mr. Nebenzia said he expects the summit to primarily focus on U.S.-Russia relations, but that “we will not be able to avoid” the civil war in Syria, the 2015 international accord on Iran’s nuclear program, which Mr. Trump has repudiated, and the Ukraine crisis. “What is he going to say, what is his preparation, is he aware of the symbolism? U.S. containment of Russia is going further than Europe would want … but if Trump then strikes up a friendship with Putin, it could leave us more in the dark about U.S. policy,” the diplomat said. Daniel Fried, a former U.S. assistant secretary of state for European affairs, said allied leaders are worried Mr. Trump will repeat at the NATO summit what occurred earlier this month at the G7 in Canada, when tensions over trade policy erupted and the President declined to sign the leaders’ closing statement. “What people are worried about is the President going into this meeting [with Putin] with a weaker hand if he is seen as blowing up alliances and not having a very good trip to London,” said Mr. Fried, now at the Washington-based Atlantic Council. Ukraine wants Russia to return the annexed Crimea region and wants pro-Russian separatists in Eastern Ukraine to hand back control of territory. The White House’s Ms. Walters said she did not know if Mr. Trump would press Mr. Putin on the issue. Mr. Trump has long expressed a desire for better relations with Russia, even as Washington tightens sanctions against the country, and the Kremlin has long pushed for a summit. Moscow made no secret on Wednesday of its delight that such a meeting had finally been agreed, with Kremlin aide Yuri Ushakov saying on Wednesday that the two men were likely to talk for several hours. He spoke of a possible joint declaration on improving U.S.-Russia relations and international security. Mr. Trump congratulated Mr. Putin by phone in March after the Russian leader’s landslide re-election victory, even though opposition activist Alexei Navalny was barred from running. But since then, already-poor ties between Washington and Moscow have deteriorated over the conflict in Syria and the poisoning of a former Russian spy in Britain, which prompted expulsions of diplomats from both countries. Mr. Bolton told reporters in Moscow on Wednesday he expected Russian interference in U.S. politics to be discussed at the summit. “Even small steps in reducing tensions would be in everybody’s interest,” remarked Finnish President Sauli Niinisto, who said he hoped Mr. Putin and Mr. Trump would discuss arms control and heed his own concerns about tensions in the Baltic Sea region. After Mr. Trump and Mr. Putin met briefly in Vietnam in November, 2017, Mr. Trump was criticized in the United States for saying he believed Mr. Putin when the Russian President denied Russian meddling. In a Twitter post on Thursday before the Helsinki meeting was announced, Mr. Trump again appeared to cast doubt on Russian involvement. “Russia continues to say they had nothing to do with Meddling in our Election!” he wrote. In Washington, the tweet drew rebukes from Democratic politicians and at least one of Mr. Trump’s fellow Republicans. Democrats said the meeting was a gift to the Kremlin and worried what else Mr. Trump might give away.